This article is about the freight railroad company. For the Chicago area Metra commuter rail line operated by the company, see BNSF Railway (Metra). The BNSF Railway Company (reporting mark BNSF) is the largest freight railroad network in North America. One of eight North American Class I railroads, BNSF has 44,000 employees, 32,500 miles (52,300 km) of track in 28 states, and more than 8,000 locomotives. It has three transcontinental routes that provide rail connections between the western and eastern United States. BNSF trains traveled over 169 million miles (272 million km) in 2010, more than any other North American railroad. The BNSF and Union Pacific have a duopoly on all transcontinental freight rail lines in the Western U.S. and share trackage rights over thousands of miles of track. The BNSF Railway Company is the principal operating subsidiary of parent company Burlington Northern Santa Fe, LLC. Headquartered in Fort Worth, Texas, the railroad's parent company is a wholly owned subsidiary of Berkshire Hathaway, Inc. According to corporate press releases, the BNSF Railway is among the top transporters of intermodal freight in North America. It also hauls bulk cargo, including enough coal to generate around ten per cent of the electricity produced in the United States. The creation of BNSF started with the formation of a holding company on September 22, 1995. This new holding company purchased the Atchison, Topeka and Santa Fe Railway (often called the "Santa Fe") and Burlington Northern Railroad, and formally merged the railways into the Burlington Northern and Santa Fe Railway on December 31, 1996. On January 24, 2005, the railroad's name was officially changed to BNSF Railway Company using the initials of its original name. On November 3, 2009, Warren Buffett's Berkshire Hathaway announced it would acquire the remaining 77.4 percent of BNSF it did not already own for $100 per share in cash and stock — a deal valued at $44 billion. The company is investing an estimated $34 billion in BNSF and acquiring $10 billion in debt. On February 12, 2010, shareholders of Burlington Northern Santa Fe Corporation voted in favor of the acquisition. BNSF Dash 9-44CW #1041 leading a manifest freight train northwest of Shallowater, Texas, running on former ATSF railroad tracks that run parallel to U.S. Route 84 as they cross the high plains of the Llano Estacado. Immediately behind the locomotive are cars painted in the old Burlington Northern livery. BNSF's history dates back to 1849, when the Aurora Branch Railroad in Illinois and the Pacific Railroad of Missouri were formed. The Aurora Branch eventually grew into the Chicago, Burlington and Quincy Railroad, (CB&Q), a major component of successor Burlington Northern. A portion of the Pacific Railroad became the St. Louis-San Francisco Railway (Frisco). The Atchison, Topeka and Santa Fe Railway (ATSF) was chartered in 1859. It built one of the first transcontinental railroads in North America, linking Chicago and Southern California; major branches led to Texas, Denver, and San Francisco. The Interstate Commerce Commission denied a proposed merger with the Southern Pacific Transportation Company in the 1980s. The Burlington Northern Railroad (BN) was created in 1970 through the consolidation of the Chicago, Burlington and Quincy Railroad, the Great Northern Railway, the Northern Pacific Railway and the Spokane, Portland and Seattle Railway. It absorbed the St. Louis-San Francisco Railway (Frisco) in 1980. Its main lines included Chicago-Seattle with branches to Texas (ex-Burlington) and Montgomery, Alabama (ex-Frisco), and access to the low-sulfur coal of Wyoming's Powder River Basin. A Eastbound BNSF domestic container train, led by BNSF Dash 9-44CW 4464 goes through Winslow, Arizona in the rain on the BNSF Southern Transcon in Northern Arizona. On June 30, 1994, BN and ATSF announced plans to merge; they were the largest and smallest (by mileage) of the "Super Seven," the seven largest of the then-twelve U.S. Class I railroads. The long-rumored announcement was delayed by a disagreement over the disposition of Santa Fe Pacific Gold Corporation, a gold mining subsidiary that ATSF agreed to sell to stockholders. This announcement began the next wave of mergers, as the "Super Seven" were merged down to four in the next five years. The Illinois Central Railroad and Kansas City Southern Railway (KCS), two of the five "small" Class Is, announced on July 19 that the former would buy the latter, but this plan was called off on October 25. The Union Pacific Railroad (UP), another major Western system, started a bidding war with BN for control of the SF on October 5. The UP gave up on January 31, 1995, paving the way for the BN-ATSF merger. Subsequently, the UP acquired the Southern Pacific Transportation Company (SP) in 1996, and Eastern systems CSX Transportation and Norfolk Southern Railway split Conrail in 1999. On February 7, 1995, BN and ATSF heads Gerald Grinstein and Robert D. Krebs both announced shareholders had approved the plan, which would save overhead costs and combine BN's coal and ATSF's intermodal strengths. Although the two systems complemented each other with little overlap, in contrast to the Santa Fe-Southern Pacific merger, which failed because it would have eliminated competition in many areas of the Southwest, BN and ATSF came to agreements with most other Class Is to keep them from opposing the merger. UP was satisfied with a single segment of trackage rights from Abilene, Kansas to Superior, Nebraska, which BN and ATSF had both served. KCS gained haulage rights to several Midwest locations, including Omaha, East St. Louis, and Memphis, in exchange for BNSF getting similar access to New Orleans. SP, initially requesting far-reaching trackage rights throughout the West, soon agreed on a reduced plan, whereby SP acquired trackage rights on ATSF for intermodal and automotive traffic to Chicago, and other trackage rights on ATSF in Kansas, south to Texas, and between Colorado and Texas. In exchange, SP assigned BNSF trackage rights over the former Chicago, Rock Island and Pacific Railroad between El Paso and Topeka and haulage rights to the Mexican border at Eagle Pass, Texas. Regional Toledo, Peoria and Western Railway also obtained trackage rights over BN from Peoria to Galesburg, Illinois, a BN hub where it could interchange with SP (which had rights on BN dating from 1990). The Interstate Commerce Commission (ICC) approved the BNSF merger on July 20, 1995 (with final approval on August 23), less than a month before UP announced on August 3 that it would acquire SP. Parents Burlington Northern Inc. and Santa Fe Pacific Corporation were acquired on September 22, 1995 by the new Burlington Northern Santa Fe Corporation. The merger of the operating companies was held up by issues with unions; ATSF merged on December 31, 1996 into BN, which was renamed the Burlington Northern and Santa Fe Railway Company. The Union Pacific-Southern Pacific merger further enlarged the combined BNSF network. Unlike BN and ATSF, UP and SP had significant overlap, where the end of competition between the two risked creating a monopoly for freight carriage in much of the West. UP and BNSF announced in late September 1995 that, in exchange for BNSF not opposing the merger, it would obtain ownership of 335 miles (539 km) of line and about 3,500 miles (5,600 km) of trackage rights to reach these "two-to-one" shippers. Significant additions included rights over SP's Central Corridor from Denver via the Moffat Tunnel and Salt Lake City, and over Donner Pass, to the San Francisco Bay Area, with an alternate route through the Feather River Canyon along UP. The ATSF trackage in California's Central Valley was linked to BN's line into Oregon, through trackage rights over UP between Stockton and Keddie and acquisition of UP's section of the "Inside Gateway" to the beginning of BN trackage at Bieber. In Texas, BNSF received rights in several directions from the Houston area: west over UP to San Antonio, with a branch to Waco, and continuing over SP to Eagle Pass (replacing the haulage rights they had just obtained); south over UP to Brownsville; east over SP to New Orleans (including the purchase of this line east of Lake Charles); and northeast over SP to Memphis with a branch on UP to Little Rock. Ownership of a short connection between Waxahachie and Dallas also went from UP to BNSF. UP, in return, got a few short sections of trackage rights over BNSF, mainly connecting the SP at Chemult to the UP at Bend, Oregon, and connecting the SP at Mojave, California with existing UP rights on ATSF at Barstow, California. On April 18, 1996, UP, BNSF, and the Chemical Manufacturers Association entered into an agreement giving BNSF rights over the UP line between Houston and East St. Louis, paralleling the Houston-Memphis SP line, and allowing BNSF to participate in the UP's plan for directional running, in which each line would serve through trains in only one direction. The Surface Transportation Board, successor to the ICC, approved the UP-SP merger on July 3, and UP control of SP took effect on September 11, 1996. BNSF trackage rights operations began on the Central Corridor on October 10, and soon thereafter on other lines. BNSF continued projects started by its predecessors, most notably BN's work on reopening Stampede Pass. BN had closed Stampede Pass, the Northern Pacific Railway's main line across Washington, in 1984, in favor of the ex-Great Northern Railway's Stevens Pass. BN never abandoned the line and began rehabilitating it in early 1996, and the route reopened in early December, relieving the crowded Stevens Pass. The ex-ATSF main line, now known as the Southern Transcon, has also seen steady work to add tracks, giving BNSF more capacity on this major intermodal route. On December 20, 1999, BNSF and the recently privatized Canadian National Railway announced plans (STB Finance Docket No. 33842) to combine as subsidiaries of a new holding company, North American Railways, which would control about 50,000 miles (80,000 km) of railroad. With CN's lines located primarily in Canada and, through subsidiary Illinois Central Railroad, on a north-south corridor near BNSF's eastern edge, the two systems had little overlap. The combination would have benefited both companies by expanding available cash for capacity improvements, and allowing for longer single-system movements. Shippers and the Surface Transportation Board expressed concern and surprise about the timing, since the merger that produced BNSF had been the only one in the 1990s that did not cause severe deterioration in service. The STB imposed on March 17, 2000 a 15-month moratorium (STB Ex Parte No. 582) on mergers involving any two Class I railroads, citing widespread opposition not only to the merger but its effects, likely starting the final round of mergers into two big systems. BNSF and CN immediately turned to the U.S. Court of Appeals, which on July 14 ruled that the STB's right to regulate mergers allowed a moratorium, and the two railroads called off the merger. The STB released its final rules (STB Ex Parte No. 582 (Sub-No. 1)) on June 11, 2001, requiring any new application to merge two Class I railroads, with the exception of smaller Kansas City Southern Railway, to demonstrate that competition would be preserved and address effects of defensive moves by other carriers. Since then, no Class I mergers have taken place. On November 3, 2009, Warren Buffett said Berkshire Hathaway would buy BNSF for $44 billion. The acquisition was approved by the boards of both companies and was approved by BNSF shareholders on February 12, 2010. With BNSF's large system, it hauls many different commodities, most notably coal and grain, as well as intermodal freight. Predecessor Burlington Northern Railroad (BN) entered Wyoming's low-sulfur coal-rich Powder River Basin in the 1970s through construction of the Powder River Basin Joint Line with Union Pacific Railroad predecessor Chicago and North Western Transportation Company. Coal goes north in unit trains on the three-to-four-track Joint Line to Gillette or south to Orin, where older BN lines and other railroads take it in all directions to coal-burning power plants. BNSF serves over 1,500 grain elevators, located mostly in the Midwest on former BN lines. Depending on where the markets are, this grain may move in any direction in unit trains, or wait in silos for demand to rise. Most commonly, grain may move west on the Northern Transcon to the Pacific Northwest and its export terminals, or south to ports in Texas and the Gulf of Mexico. The Atchison, Topeka and Santa Fe Railway's main contribution to BNSF was the Southern Transcon, a fast intermodal corridor connecting Southern California and Chicago. Most traffic is either trailers of trucking companies such as intermodal partner J. B. Hunt, or containers from the Ports of Long Beach and Los Angeles. The latter begins its trip on the triple-track Alameda Corridor, shared with the Union Pacific Railroad, and then follows BNSF rails from downtown Los Angeles. Its route, the Southern Transcon, has been almost completely double-tracked, and triple-tracking has begun in areas such as Cajon Pass. BNSF transports Boeing 737 fuselages from the Wichita, Kansas plant to Renton, Washington. BNSF ES44DC 7402 leads a train of Boeing 737 fuselages at Greenwood, Nebraska in October 2014. An eastbound BNSF Railway train passes some maintenance of way equipment in Prairie du Chien, Wisconsin, August 8, 2004. The lead unit is painted in the Heritage II scheme. The BNSF Railway directly owns and operates track in 28 U.S. states: Alabama, Florida, Arizona, Arkansas, California, Colorado, Idaho, Illinois, Iowa, Kansas, Louisiana, Minnesota, Mississippi, Missouri, Montana, Nebraska, Nevada, New Mexico, North Dakota, Oklahoma, Oregon, South Dakota, Tennessee, Texas, Utah, Washington, Wisconsin, and Wyoming. The railway also operates a small amount of track in Canada, including an approximate 30-mile (48 kilometer) section that runs from the U.S.-Canada border to Vancouver, British Columbia, some tracks and a yard in Winnipeg, Manitoba, approximately 70 miles (110 km) of joint track with the Canadian National Railway, which runs south to the U.S. border at Emerson, Manitoba, and less than a kilometer of trackage at the border in Northgate, Saskatchewan. For administrative purposes, BNSF is divided into two regions and ten operating divisions. The North Region includes the Montana, Northwest, Twin Cities, Heartland and Powder River divisions. The South Region includes the Red River, California, Chicago, Kansas and Southwest divisions. Each division is further divided into subdivisions, which represent segments of track ranging from 300-mile (482 km) mainlines to 10-mile (16 km) branch-lines. The former Texas and Gulf divisions were combined into the Red River Division, and the former Springfield and Nebraska divisions were combined into the Heartland Division, in the spring of 2016. Not including second, third and fourth main-line trackage, yard trackage, and siding trackage, BNSF directly owns and operates over 24,000 miles (38,624 kilometers) of track. When these additional tracks are counted, the length of track which the railway directly controls rises to more than 50,000 miles (80,467 kilometers). Additionally, BNSF Railway has gained trackage rights on more than 8,000 miles (12,875 kilometers) of track throughout the United States and Canada. These rights allow the BNSF to operate its own trains with its own crews on competing railroads' main tracks. BNSF locomotives also occasionally show up on competitors' tracks throughout the United States and Canada by way of leases, mileage equalizations, and other contractual arrangements. BNSF 880362, a tank car passing Glen Haven, Wisconsin, shows the new corporate logo on June 3, 2006. BNSF operates various facilities all over the United States, plus a yard in Winnipeg, to support its transportation system. Facilities operated by the railway include yards and terminals throughout its rail network, system locomotive shops to perform locomotive service and maintenance, a centralized operations center for train dispatching and network operations monitoring in Fort Worth, and regional dispatching centers. BNSF Railway also operates numerous transfer facilities throughout the western United States to facilitate the transfer of intermodal containers, trailers, and other freight traffic. BNSF Railway has direct control over a total of 33 intermodal hubs and 23 automotive distribution facilities. The BNSF mechanical division operates 13 locomotive maintenance facilities that perform preventive maintenance, repairs and servicing of equipment. The largest of these facilities are located in Alliance, Nebraska and Argentine Kansas City Kansas. The mechanical division also controls 46 additional facilities responsible for car maintenance and daily running repairs. The BNSF system mechanical division, a subset of the mechanical division, operates two maintenance-of-way work equipment shops, responsible for performing repairs and preventive maintenance to BNSF's track and equipment, in Brainerd, Minnesota and Galesburg, Illinois. The system mechanical division also operates the Western Fruit Express Company's refrigerated car repair shop in Spokane, Washington. In 2006, BNSF teamed with Vancouver, WA-based Tri Star to run BNSF's new transload facility in Fontana, CA, near the California Speedway. Large freight car hump yards are located throughout the BNSF system. The Northern Transcon runs from Seattle to Chicago. The route is a combination of parts of the old Great Northern, the Northern Pacific, and the Spokane, Portland and Seattle Railway. The Southern Transcon runs from Los Angeles to Chicago. The 2006 BNSF Annual Report states: "We also added about 33 miles of second main track on our main line between Chicago and Los Angeles. All but 51 miles [82 km] of this high-volume 2,200-mile [3,540 km] route were double track, as of the end of 2006. Last year, we ran 100 trains per day on this expanded main line, compared with 60 per day in 2000." Technically, it is not double tracked in mid-Kansas where two routes are used: Mulvane to Wichita to Newton to Emporia for primarily eastbound traffic; Emporia to El Dorado to Augusta to Mulvane for primarily westbound traffic. In 2008, BNSF completed nearly sixteen miles (26 km) of a third main track through Cajon Pass in Southern California, increasing capacity on the transcontinental main route between Chicago and Los Angeles from 100 to 150 trains per day. BNSF started adding a second main track in Abo Canyon (east of Belen, New Mexico) the largest bottleneck on the Transcon with grading in 2008-2009, bridges in 2010 and signal work in late 2010 or early 2011. Approximately 1.7 million cubic yards [1.23 million m²] of rock need to be excavated, mostly by blasting. The 2008 BNSF Annual Report states: "Following completion of the Abo Canyon project scheduled in 2011, our 2,200‑mile [3,540 km] Transcontinental Corridor between Southern California and Chicago will have only about 30 miles [48 km] of single track." The Powder River Basin supplies forty percent of the coal in the United States. The 2008 BNSF Annual Report states that the quadruple track project was completed. The BNSF system is divided into 13 divisions grouped into three regions. Each division includes numerous subdivisions, normally comprising a single main line and branches. A fourteenth division, Colorado, has been consolidated with the Powder River Division, except for the Casper and Cody Subdivisions, which were transferred to the Montana Division. The BNSF Railway hosts commuter trains: BNSF Railway Line for Metra (Chicago), Metrolink (Southern California), Northstar Commuter Rail, and Sounder (Puget Sound). The line used by New Mexico Rail Runner Express was sold to the state of New Mexico, but BNSF retained all freight rights on the line and operates freight trains as needed. Metra's cars that were originally purchased by BNSF predecessor Chicago Burlington & Quincy have letterboards above the doors. In about 2011, about 15 of the remaining cars had the original "BURLINGTON" lettering restored, while the rest now read "BNSF RAILWAY". Other Metra cars assigned to BNSF have the current BNSF "swoosh" logo next to the door. Many Amtrak routes use BNSF rails: the Amtrak Cascades, California Zephyr, Carl Sandburg, Coast Starlight, Empire Builder, Heartland Flyer, Illinois Zephyr, Lincoln Service, Pacific Surfliner, San Joaquin, Southwest Chief, Sunset Limited, and Texas Eagle. Although it does not have a steam program like the Union Pacific, the BNSF has allowed for the Southern Pacific 4449, St. Louis–San Francisco 1522, Santa Fe 3751, Spokane, Portland and Seattle 700 and Milwaukee Road 261 steam locomotives to operate excursions over their rails. Overall, BNSF is a safely operated railway as evidenced by receiving the E.H. Harriman Award for safety multiple times. But a number of accidents and incidents have occurred on the railway since its inception. As one of the leading supporters of the Operation Lifesaver program to promote safety at railway crossings and rights-of-way, the BNSF Railway, in 2000, established a grade-crossing closure program. This program, in which BNSF works with communities and landowners to identify unnecessary or redundant crossings, has helped close more than 2,900 of BNSF's railway crossings throughout the United States. Due to the program, BNSF has been the industry leader in lowering the number of grade-crossing collisions. BNSF contracts with News Link, a small business in Lincoln, Nebraska, to publish employee newsletters focused on safety for some of the railroad's divisions and shops. These newsletters vary in length from four to 28 pages, published ranging from monthly to quarterly. In 2014, the Occupational Safety and Health Administration ordered BNSF to pay over $526,000 to workers who had been terminated in 2010 and 2011 after revealing workplace injuries at the terminal in Havre, Montana, which is in contravention of provisions of the Federal Railroad Safety Act protecting whistleblowers. According to the 2007 BNSF Annual Report, at the end of 2007 the railway had more than 40,000 employees; 6,400 locomotives; and 85,338 freight cars. At the end of 2007, the average age (from date of manufacture) was 15 years for the BNSF's locomotive fleet and 14 years for the freight car fleet. On January 24, 2006, BNSF announced a $2.4 billion program of infrastructure upgrades for 2006. The upgrade program includes: double- and triple-tracking 40 miles (64 km) of track and a second mainline track through New Mexico's Abo Canyon on the former ATSF transcontinental line; expanding the Lincoln, Nebraska, classification yard and double- and triple-tracking 50 miles (80 km) of track in Wyoming's Powder River Basin region; expansions at eight of the railroad's larger intermodal facilities, and extending many sidings and expanding and improving refueling facilities. In making the announcement, BNSF chairman Matthew K. Rose cited improvements in the company's return on invested capital, and expressed hope for continued improvement. In March, 2008, the railroad was completing the triple-tracking of Cajon Pass in California, creating four tracks through the pass—three BNSF (former Santa Fe and newly installed) and one Union Pacific (former Southern Pacific). The assortment of colors used on the BNSF Railway makes it one of the most colorful Class I railroads in North America. Most of BNSF's high-horsepower road locomotives are painted in "Heritage" schemes - primarily based on BN predecessor Great Northern Railway's colors of Omaha Orange and Pullman Green, with yellow striping and silver underframes. Since 2005, BNSF's locomotives feature black instead of dark green paint, reminiscent of the original 1970 Burlington Northern scheme. Most of BNSF's BN-ordered SD70MAC's still bear the Executive colors of Grinstein green and cream. Several ex-ATSF C44-9W's still retain their red-and-silver "Warbonnet" colors, and a large portion of EMD and GE yard power are still in their original green Burlington Northern or blue-and-yellow Santa Fe schemes. "Heritage III" or "Nike Swoosh"
The first locomotive to bear BNSF lettering was BN SD70MAC No. 9647, introduced in late August 1995, just as the Interstate Commerce Commission was approving the merger. VMV Enterprises in Paducah, Kentucky painted it in a one-of-a-kind "commemorative" scheme, combining Santa Fe's "Warbonnet" with BN's "Executive" colors of dark "Grinstein green" and cream (instead of SF's red and silver). "BNSF" replaced "SANTA FE" on the front of the unit, and "Burlington Northern Santa Fe" was painted on the side. Dubbed as "Premium Heritage," the paint scheme was widely rejected by the public, and was often called the "Vomit Bonnet" and the "Barfbonnet." In the spring of 2013, this unit was sent to Relco in Albia, Iowa, to be repainted into the current BNSF Heritage III scheme. By January 1996, BNSF had begun painting locomotives in the old BN and ATSF schemes by adding "BNSF" on the sides. Then, in late May, the company introduced a new design on BN SD60M 9297 (then 8197 and now 1474), painted mainly in BN predecessor Great Northern Railway's pre-1967 colors of orange and dark "Pullman green," but also incorporating red and silver, and said to represent all major BN predecessors and Santa Fe. 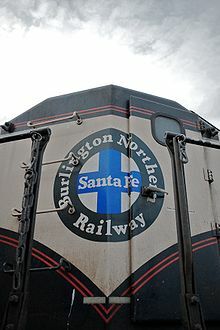 On the front was a new logo, placing "Burlington Northern Santa Fe Railway" in the Santa Fe cross. Some of the striping details were different on each side, and employees voted for the simpler right-side design, which, with some minor changes, became the new scheme, replacing the BN colors. However, president and CEO Robert Krebs said the railroad was big enough for two designs, and Santa Fe's "Warbonnet" (with "BNSF" instead of "Santa Fe" on the front) remained alongside the new "Heritage I" scheme. EMD SD70MAC 9647 August 1995 First locomotive experimented in pre-Burlington Northern Santa Fe Livery using Burlington Northern colours. EMD SD75M 8251 December 1995 First BNSF lettered locomotive utilizing the Santa Fe "Superfleet" paint scheme while retaining the Santa Fe cigar band on the nose. EMD SD70MAC 9711 January 1996 First BNSF lettered locomotive utilizing the Burlington Northern "Executive" paint scheme while retaining the Burlington Northern Logos on both ends of the carbody. EMD SD60M 9297(Renumbered to 8197, then renumbered again to its present number 1474) May 1996 First BNSF painted locomotive utilizing Omaha Orange, Brunswick Green, Santa Fe Red, Zephyr Silver and Big Sky Blue. Created to receive input from employees & shareholders about a new paint scheme. Known as "The Great Pumpkin". GE C44-9W 960 August 1996 First BNSF locomotive painted using input from BNSF 9297. Originally delivered with Santa Fe "Superfleet" red walkways, later changed to green. This scheme now utilized Great Northern Omaha Orange, Northern Pacific Lowey Green, Chicago Burlington & Quincy Zephyr Silver, and Santa Fe Yellow. EMD GP38-2 2099 August 1996 First ex-Burlington Northern locomotive to be repainted into the BNSF Scheme, utilizing Zephyr Silver for trucks and fuel tank. EMD GP35 2540 January 1997 First ex-Santa Fe locomotive to be repainted into the BNSF scheme, utilizing the Lowey Green instead of the Zephyr Silver for trucks and fuel tank. GE C44-9W 740 August 1997 First BNSF locomotive to be painted by General Electric using Santa Fe inspired designs. Dubbed "Heritage II". EMD SD70MAC 9838 November 1997 First BNSF locomotive to be painted by Electro Motive Division using Santa Fe inspired designs. On January 24, 2005, as part of its tenth anniversary celebration, the Burlington Northern and Santa Fe Railway was renamed BNSF Railway, which adopted a new logo. By March, the logo had been applied to the sides and fronts of six ES44DCs, which were otherwise painted in the "Heritage II" scheme, except with black replacing dark green. Slight differences were present on the six locomotives, and on April 11 BNSF officially chose the design it had applied to No. 7701. The "New Image" scheme is also referred to as "Heritage III", the "Nike Swoosh" scheme or simply the "Swoosh" scheme. Some railfans also refer to the logo as "The Wedge" scheme. Since 2006, BNSF's locomotives designated for yard work or local trains have been painted in the "Heritage IV" scheme. Somewhat of a simplified form of the "Heritage III" scheme, "Heritage IV" is virtually identical to the original "Heritage I" scheme, albeit with black instead of dark green, and the current "Nike Swoosh" BNSF logo. Locomotives such as SD40-2's, GP38's, GP60M's and SD60M's have been painted in this scheme. In October 2017 nine GE B40-8W locomotives rebuilt by GE were painted into this scheme. A BNSF train crosses Lake Ashtabula on the Sheyenne River west of Luverne, North Dakota. The 2,736 ft (834 m) Sheyenne River Bridge was erected in 1912 by the Great Northern Railway. The North Country Trail, a 4,600 mi (7,400 km) recreational trail, passes beneath the bridge. Burlington Northern Santa Fe Manitoba, a subsidiary of BNSF, located in Winnipeg, Manitoba. ^ "TABLE 2-9 OPERATIONAL DATA, BY RAILROAD, 2010". Railroad Safety Statistics: 2010 Annual Report. U.S. Dept. of Transport. April 4, 2012. ^ "Financial Information". BNSF website. ^ BNSF Railway (January 24, 2005). "BNSF Adopts New Corporate and Subsidiary Logos and Changes Name of Railway Subsidiary as Part of Tenth Anniversary Celebration". Archived from the original on November 29, 2005. Retrieved April 19, 2006. ^ "BERKSHIRE HATHAWAY INC. TO ACQUIRE BURLINGTON NORTHERN SANTA FE CORPORATION (BNSF) FOR $100 PER SHARE IN CASH AND STOCK" (PDF) (Press release). BNSF Railway. November 3, 2009. Archived from the original (PDF) on November 22, 2009. ^ "Berkshire Bets on U.S. With a Railroad Purchase". New York Times. November 3, 2009. Archived from the original on 6 November 2009. Retrieved November 4, 2009. ^ Greg Morcroft and Alistair Barr (November 3, 2009). "Berkshire Hathaway to buy Burlington Northern Santa Fe". MarketWatch. Archived from the original on 4 November 2009. Retrieved November 4, 2009. ^ Andrew Frye (November 3, 2009). "Berkshire Buys Burlington in Buffett's Biggest Deal". Bloomberg L.P. Retrieved November 4, 2009. ^ "Warren Buffett: Buying Near the Bottom … Again". Wall Street Journal. November 3, 2009. Archived from the original on 9 November 2009. Retrieved November 4, 2009. ^ Ellis, David (November 3, 2009). "Buffett's firm to buy Burlington Northern". ^ "BNSF Agricultural Facilities: On-line Grain Elevator Directory". Archived from the original on 2009-05-09. Retrieved May 1, 2009. ^ BNSF Railway opens Logistics Park Kansas City; The Kansas City Star; October 17, 2013. ^ BNSF Dedicates Opening of its New Logistics Park Kansas City Intermodal Facility; BNSF; October 17, 2013. ^ "BNSF Subdivison Map" (PDF). BNSF Railway. Retrieved August 3, 2018. ^ BNSF Railway Twin Cities Division, Northern Light Archived 2012-03-01 at the Wayback Machine (employee newsletter), March 2009: "The Mobridge Subdivision from Aberdeen to Hettinger ceded from Twin Cities Division to the Montana Division Jan. 20 to break down territory in the region, allowing for better coverage." ^ "Burlington Northern Santa Fe Railway ordered by US Department of Labor's OSHA to pay more than $526,000 to terminated workers". Occupational Health & Safety Administration, US Department of Labour. 23 April 2014. ^ "BNSF Announces $2.4 Billion Capital Commitment Program for 2006; About $400 Million Again Slated for Track/Facilities Expansion" (Press release). January 24, 2006. Archived from the original on 2010-02-05. Retrieved January 30, 2006. ^ "BNSF - Sheyenne River Bridge". Bridgehunter.com. July 22, 2013. BNSF Railway (January 24, 2005), BNSF Adopts New Corporate and Subsidiary Logos and Changes Name of Railway Subsidiary as Part of Tenth Anniversary Celebration. Retrieved January 25, 2005. BNSF Railway (February 9, 2005), Port of Los Angeles begins discussions with BNSF Railway Company on new intermodal facility. Retrieved February 10, 2005. Wikimedia Commons has media related to BNSF Railway.